This title is directed primarily towards health care professionals outside of the United States. 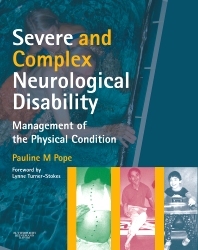 This book presents a holistic approach to the complete, long-term, day-to-day care of patients disabled by neurological conditions, emphasizing practices that promote physical well-being and minimize secondary complications. It focuses on physical management within the context of the lifestyle of the disabled person and primary caregiver. In addition, it highlights the difficulties commonly encountered when implementing a physical management regime, and discusses the importance of compromise. The complete physical management and day-to-day care is described in a practical and applicable way. Best practices are presented in relation to caring for a person with profound impairment and residual disability. Holistic and detailed long-term physical management strategies are described, related to the more severe and complex neurological conditions. Real-life examples help readers understand the applications of theory in practice. Case studies strengthen readers' critical thinking and decision making skills. Social considerations and the importance of therapeutic leisure activities are included.